The stainless steel spacers and covers create together with the eye-catching wood work a very noble RACK for the TRINITY Golden Reference Edition. The 3mm polished marble surface of the rack levels gives the RACK a very elegant appearance. 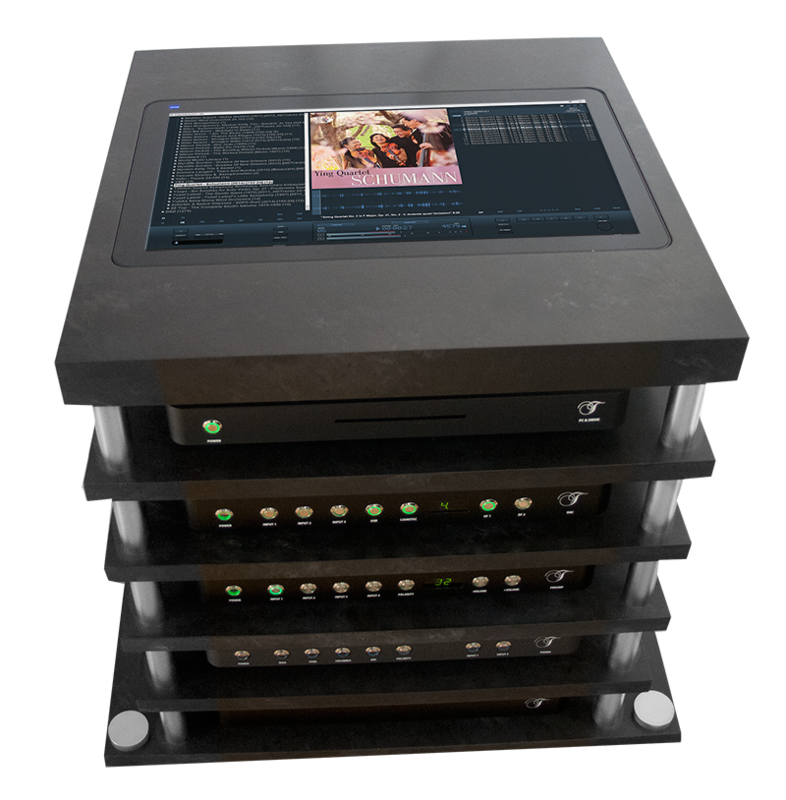 Operating the mediaPC&Transport becomes a breeze thanks to the perfectly adapted 21.5” touch screen (1920 x 1080) in the top level of the RACK. The RACK is placed on special spring loaded Vibration damping feet. These feet are passive, small, efficient and maintenance-free. These mechanical bearings isolate vibrations in six degrees of freedom. The vertical and horizontal resonance frequency of these customized feet is around 1Hz. This gives a very good damping between 1.5Hz and 7Hz and an excellent damping above 7Hz. The TRINITY Power AMP platforms and RACK provide an affordable and effective solution to damp up to 90% of the vibration normally found in a household.